Disgraced democratic Congressman Anthony Weiner’s wife, Huma Abedin, has been garnering just as much press as her scandal-ridden husband in the wake of Rep. Weiner admitting that he not only sexts, but has had online relationships with as many as six other women. Normally when a politician is caught with his pants down, on or offline, the media’s attention wanders over to the wife: Will she or won’t she stand by his side as he weeps for forgiveness at the podium? And then, of course, the inevitable question is whether or not she will leave him. But Weiner’s wife is no ordinary political wife. Abedin’s parents were both academics from India and Pakistan. A practicing Muslim born in Michigan, Abedin moved to Saudi Arabia as a young girl, and returned to the US to attend college at George Washington University (GWU). During a White House internship in 1996, Abedin was mistakenly assigned to the first lady’s office when she had requested to be in the press office. She has been a close aide to Hillary Clinton ever since. From traveling chief of staff to deputy chief of staff, to her current senior aide position in Clinton’s State Department, Abedin is never far from the Secretary of State, and is often dubbed as “Hillary’s shadow,” and “secret weapon.” Last year, Fmr. President Bill Clinton, who refers to Abedin as a daughter, officiated her wedding to Weiner in Long Island. Now that she is the victim of the congressman’s indiscretion, the Democrats are furious at this guy. He [Weiner] is married to one of the most popular people in the Democratic Party. Abedin, setting a standard I think all wives, political or not should follow, opted to skip out on Weiner’s press conference and focus on her job. She set off with Hillary Clinton on a week long global diplomacy trip to Libya, the UAE, Tanzania, and Ethiopia. Like boss, like employer? At least we know Abedin can get advice on how to cope from a woman who knows this terrain better than anyone, Mrs. Clinton herself. For once scandal has found a politician who just may have a wife more powerful, influential, and popular than him. There is no question here about who needs who more, and that, at least for now, Abedin is rejecting the role of the good wife. However, with breaking news that Abedin is pregnant with the couple’s first child, and increasing pressure on Weiner to resign, there is no doubt Weinergate has gotten more complicated. But whichever road Huma decides to embark on, I think we can all be confident that wives around the world should take note. 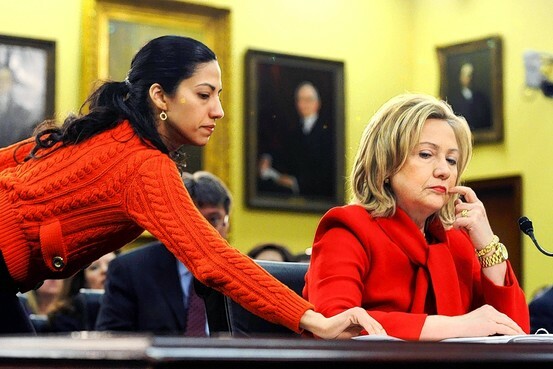 With or without her Congressman by her side, Abedin is one smart woman to watch and follow. This fellow has no redeeming features. She definitely does NOT need to “stand by him.” Get rid of him and get on with your life!!!! I agree! She’s too young and smart, and has way too much going for her to stay put. All the information is available on the web, so best to Google it. This is a classic insecurity about powerful women.